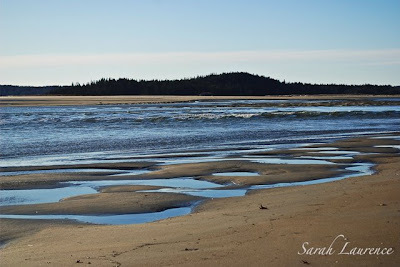 At low tide you can walk across a sandbar to an island off Popham Beach. The view from the rocky peak would be glorious except for one little problem. What is wrong with this picture? Let me zoom in and enhance the blues. Now can you see? Our friends from NYC were dressed for the weather but not for a swim. The waves were coming in fast. The wide sandbar from minutes ago was gone. My dog charged ahead into the water. She wasn’t swimming . . . yet. Maybe it was the adrenaline or the time lag of seasonal change, but the water didn’t feel too cold until we got out, dripping to our knees. It was a “warm” day but still close to freezing. 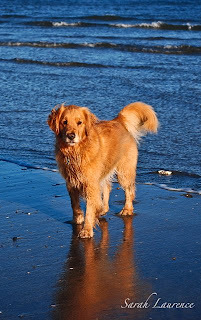 Do not assume that the beach and the tides will be the same from year to year. You can’t always get there from here. Don’t be an effing idiot. This year the tide has gone crazy, and the beach has been eroding faster than ever. Had we been much slower, we would have had to wait until after nightfall for the next low tide. 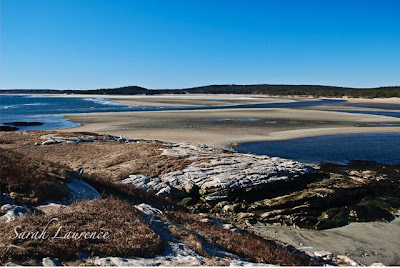 Cell phones rarely work on this remote beach in Phippsburg. Our footprints were washing away. Amazingly Marika didn’t hold a grudge. My remorse was tainted by inspiration. As the others fretted over wet feet and then laughed, I was skipping one book ahead. What would happen if I sent two characters out to that island, and they couldn’t come back? Novel writing is risky business. Novel writing is risky business, indeed, and with those gorgeous pictures dancing in your head it must be a tough job reining your imagination in :-)! Thank you very much indeed for another thoughtful and well-written post. I have always seen tides and their effect on beaches as nature's way of warning us, humans, not to think too highly of ourselves. You can always get stranded and with no mobile signal, who are you, then? You're just a poor soul at the mercy of the elements. Your post also reminded me of the time when I was in college (high school for Americans) and we all went off to a campsite between Havana and Matanzas. The site was on the beach and we all went for a swim in the ocean. We did not know anything about tides and therefore laughed at a local's suggestion that we pack up and go back to our huts because the tide would be coming in in no time. Some of us, backed off a little bit but a friend of mine, Tania, kept swimming out. In a matter of minutes she found herself isolated and quite far from the shore. Although a good swimmer even she could not swim against the waves. She almost drowned and was saved by... the local man who had warned us about the tide. What an adventure! COLD adventure...still if it gave you an idea...maybe it was worth it! What fun! Your friends will forever laugh and remember this unforgettable day running thru the Maine ocean to beat the surf! Such memories. ACIL, how right you are about nature’s check on our arrogance. That’s a scary story about Tania being swept out to sea. I admire the local for both the warning and the rescue. As we were wading back, a bunch of people stood on the beach watching. Some had been on the island too and had wet legs. I like to think that they were waiting to call for help if needed. After we came in, a couple of those guys changed into swim suits and went swimming! Needless to say, they were locals. 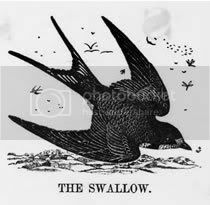 Troutbirder, the best thing about writing is that the worst experiences become the best material. I’m happy to hear I’m not the only fool caught out by the tide who survived to tell the tale. Cynthia, next time I’ll let my imagination do the wading! Tina, good friends are ones that laugh over misadventures. I still felt guilty. JaPRA, nature appears the most beautiful when it’s dangerous. I can’t believe I was standing there snapping photos without really seeing the images. You are right: a good adventure ends in smiles. Thanks! Hurrah! More evocative, beautiful photos. I can quite see how those could evoke the setting for a novel. Have you read Joe Coomer's 'Beachcombing for a Shipwrecked God'? If not, I feel sure you'd enjoy it, Sarah. Oh, and a very happy, creative and artistically creative 2009 to you! Yes, Nature is both stunningly beautiful and, at times, treacherous. The female lead in your latest book? Mother Earth/ nurturer/ Seductress/whore. Oh my. But the setting and light are astounding. Has your dog found any good i-pods lately? I'm still recovering from Christmas and planning a trip to India. You can imagine how much writing I'm doing. Tessa, thanks! 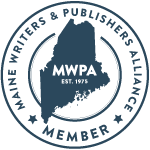 I had seen Coomer’s latest, Pocketful of Names, in the bookstore and was intrigued as it is set in Maine. The book you recommend must be an earlier one. I should check him out. A creative new year to you too! Elizabeth, I do like books where nature seems more of a character than a setting. How exciting about going to India! Have you read Windy Skies in my sidebar? He blogs from India and has lovely photos and evocative descriptions. That skipping around sandbars sounds really adventurous! Any theories about the beach erosion? Between the ice storm and being stranded, your new characters are certainly going to be "in conflict" with nature! Bee, I don’t know the cause of the erosion. It’s a state park. The usual culprits are development and foot traffic in the dunes, but both are banned. Global warming? I’m going to enjoy playing with the force of nature in my next book. Leon, thank you and welcome to my blog. I enjoyed the philosophical post about love on yours. I've taken that walk, too, although usually in warmer climes. Since I moved away from the coast, the awesome power of the ocean is one of the things I miss the most. Thanks for reminding me how beautiful it is. That was a good story with great photos, makes my legs and feet cold just reading it. It reminds me of an Eastern Shore rural legend of a watermen who never learned to swim getting stuck in the mud at low tide, his hip waders filled with water and he drowned. I am not sure if it was true or a tale to warn children of the dangers of water and tides. Beautiful photos, it looks really cold there! Gosh, what a brilliant blue sky!! Perhaps if it were warmer, being stranded until nightfall wouldn't be so bad. No cellphone, a thermos of hot tea, a good book....not too bad at all! Of course, if drowning was an issue, I would naturally rethink things. Stunning pics as always. Stunning! You cant always get there from here is a good and salutary reminder. lovely photos and great story here. Tides are spooky and exciting things and dangerous with it. Tides can be very tricky things! I think it's neat how events in your daily life make you think of situations in novels and stories that could be written about. What a great thing to be a writer and to create lives and people and situations like that! 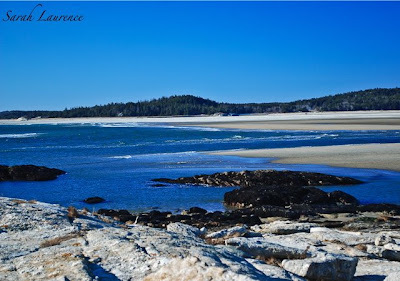 Mary Ellen, I do love living near the ocean, but in land Maine is beautiful in its own way and less developed too. Les, that sounds like a Maine story. 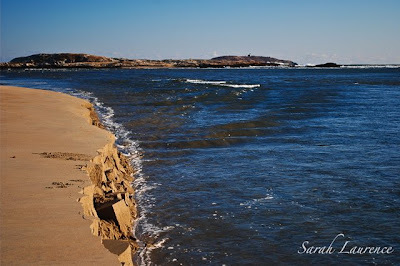 I just heard that the coast guard had to rescue some people off Fox Island (that island off Popham) recently. The erosion is supposedly due to natural causes, and it’s totally changing the landscape. It's not just the tide alone - there's a river that has changed course that feeds onto that beach. At least the river water raises the temperature. Phillip, it is cold, but that’s part of the beauty. The deep blue skies come with winter. Pamela, the island never submerges, just the sandbar, but it would too cold and windy to stay for long. 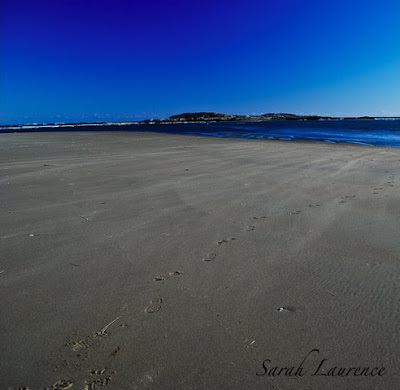 In the summer you’ll catch me lounging on Popham Beach with a good book. I agree that it’s much more relaxing without cell phones unless you need help…. Sizzie, it is easier to enjoy the view with warm feet. If only I had followed rule number four. Elizabeth M., welcome to my blog and thank you. I’ll come visit soon. 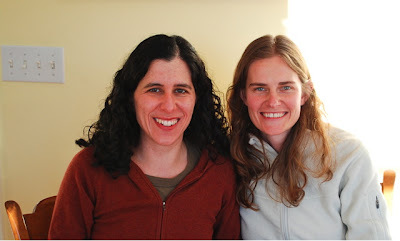 Donna, moving to Maine was what motivated me to start writing novels. There have been so many unexpected adventures. It’s good for fiction and for blogging. 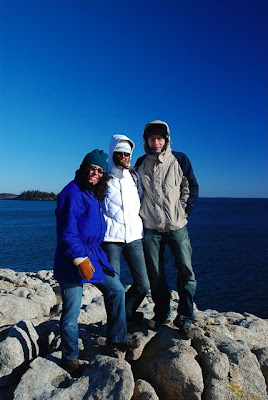 I should have gotten a photo of us wading out of the ocean in our parkas, but I was afraid everyone would kill me. close, but obviously does not run in your veins. You are certainly not "ship shape in Bristol fashion." Glad you made it back safely, Sarah. You have a true writer's mind--always seeing a new idea for a novel in your surroundings. By the way, I borrowed a copy of Twilight from my granddaughter and have begun reading it. After reading your review, I wanted to know what it is that has captivated so many teens. D, sorry to disappoint, but the Brit was as culpable as I. Rose, if only I’d had a mariner’s mind that day! Still, it will make a good story, and ours ended happily. I’m curious to hear what you make of Twilight. My daughter enjoyed the series, but she’s getting sick of her friends’ obsession with it. I feel like I opened a door into her world by reading it. A mere 38 degrees! And our socks acted as wet suits, so no harm done. It was all worth it for those photos (and a possible chapter for your novel?). I still recommend a trip to Hotel Laurence! Is erosion of the beach a natural course of things each year? I love that quote "novel writing is risky business"! So funny. I also love your advice to us, and yourself, to not be an effing idiot. Oh well! We all get ourselves into predicaments like that, don't we? At least your friends were forgiving. Beautiful photos, Sarah. Such rich blue hues and so clear. Marika, you are one welcome guest! Anil, the erosion is natural. It’s especially bad because the Morse River has changed course, but no one knows why. Risky is the opposite of boring, but stupid is also the opposite of wise. Alyson, it’s all worth it for a good laugh. It must be something like survival of the fittest with my friends, literally. That clear blue sky is quite typical of a Maine winter. It comes in extremes – sunny and clear or stormy. Long over due Happy New Year Sarah! I loved the Maine Rules. At least a couple of them may become Audrey Rules. Audrey, welcome back and happy new year too! I was going to comment on your new post but there's no box available. It looks like a good read but slow reads for me at the moment are a no-no as I have 'Ulysses' (yes, that 'Ulysses'!) awaiting me. Thanks for the recommendation, though. ACIL, how strange. The comment box is working fine now. Edgar Sawtelle would be faster paced and easier to read than Ulysses. Good luck! 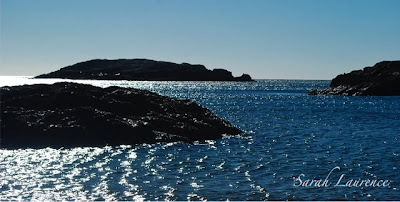 I couldn't find anywhere to put comments on your today's post...the outdoor photos are fresh as usual...I read "A Thousand Acres" a few years ago and I saw the movie...I feel ashamed to say I never made the King Lear connection. hum... The point you raise about how a certain type of reading fits a certain season...interesting...it reminded me of the Native Americans saving storytelling for winter. I can see how the wife and son have no friends (the other novel)-when you live in the country, you have to make an effort to socialize. I love the company of my dogs, too. I think sometimes they like me best of all...irresistible! Cynthia, ACIL had the same problem but JaPRA commented without problem. I’ve republished the post so hopefully that helps. The comment part is below the YouTube. Sorry for the confusion. I like the tradition of winter stories. I can be a bit of hermit too at this time of year. Dogs and books are great company. You might not have recognized Lear because Smiley puts in her own interpretation of why 2 of the daughters hated their father. She also used different names. Her version made more sense and brought something new to the story. "The Story of Edgar Sawtelle" is the first book I read this year. I read it in about a week, finishing it this past Sunday. I liked the story, especially since I'm a dog lover, but I hated the ending. I can't understand why this book is a NYT bestseller with a seemingly meaningless, bleak ending like that. Perhaps I need to analyze it better. I didn't realize it was supposed to be a modern-day take on Hamlet. Thank you for your insightful analysis on the book! Donna, Hamlet is a tragedy so Wroblewski was stuck in that narrative structure. I can identify with your feelings, and I knew it was coming. I've copied your comment to the post above on Wroblewski's Story of Edgar Sawtelle. A couple other people couldn't find the comment section - it's under the YouTube screen. I couldn't find where to comment either. Anyway, I might have to save this book for a few years when I have a moment to spare to read slower paced novels. My 3 year old makes that impossible right now. You are so brilliant at adding your own photos to your book reviews. Such a cool blend! Alyson, thanks for finding a place to comment anyway. I’ve copied it to the post above. I’m impressed that you get any reading done between a 3 year old, your blog and 3 more kids. My photos with book reviews work for these northern books.